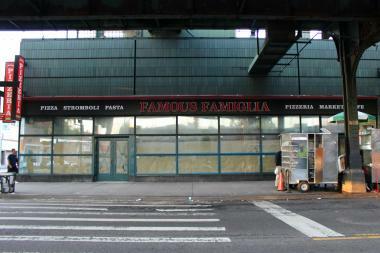 The Famous Famiglia space has been empty since 2011. JACKSON HEIGHTS — Next stop...pizza. The restaurant slated for a long-vacant retail space inside a busy transit hub has moved closer to completion after the MTA approved its latest designs, according to a spokeswoman for the transit authority. The nearly 3,000-square-foot, two-story location near the 74th Street station has been empty since the station’s muti-million dollar renovation last decade. Pizza chain Famous Famiglia was awarded the bid to develop the space in 2011, beating out other a dozen other retailers, according to Second Avenue Sagas. The company signed a 20-year lease, but the space has been empty since 2011. The MTA confirmed that certain design specifications had to be revised and were approved last week, which means the pies may soon be slung on Roosevelt Avenue. "The contractor has resumed working and barring any unforeseen new issues or further delays, construction should be finished by the end of the summer," said Deirdre Parker, an MTA spokeswoman. She said there was a "protracted debate over design specifications for an ejector pit that removes waste water from premises." The full designs for the restaurant, according to the MTA, were not approved until March 2012 and construction on the large project began in April 2012. The latest hurdle will allow construction to resume at the location, Parker said, although she could not confirm when the restaurant would open. City Councilman Danny Dromm said the latest news involving the sit was "very good news indeed." "We are anxiously awaiting the opening of Famous Famiglia, and have been wanting to have that site opened for a very long period of time," he said. "It's the hub of the Jackson Heights business district and not having it open had been a blight on the community," he said. There are two other Famous Famiglia pizza shops in Queens, in each of the borough’s airports. In 2011, the president of Famiglia-DeBartolo told the Daily News the Jackson Heights location would be the company's first location in the subway system. "We don't think there are enough pizza places in the area and we hope to satisfy that void," said Paul Kolaj. Calls made to the Westchester-based chain for a comment were not returned.